The Irony! 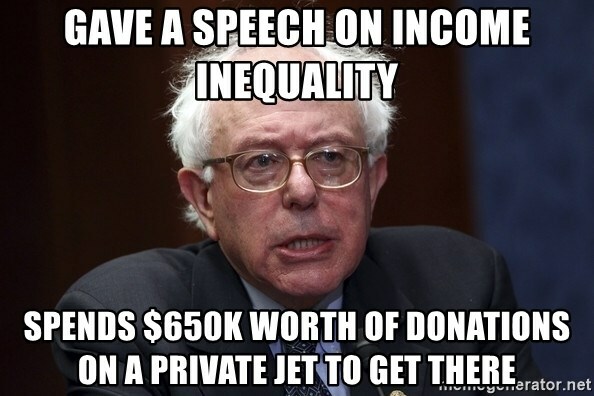 The Longtime Socialist Democrat Has Raised The Most POTUS Campaign Cash. 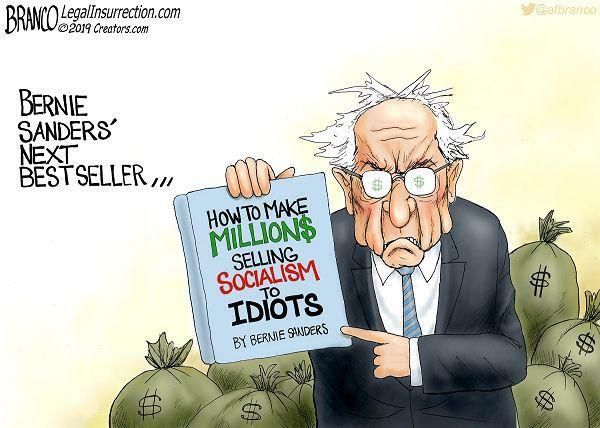 Democrat socialist Bernie Sanders believes money is evil and America is much too rich. 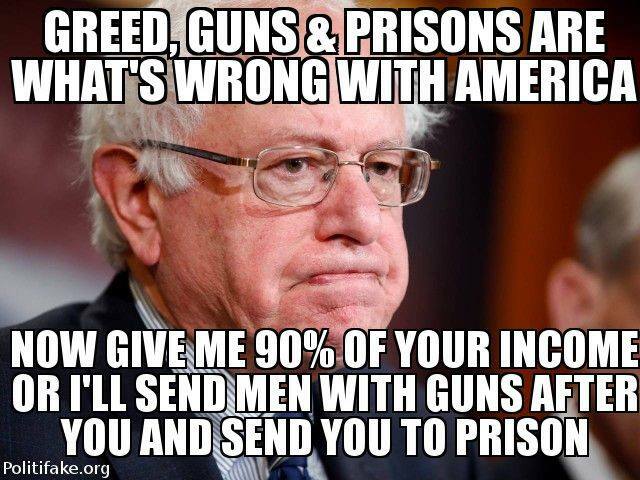 Send all your money to Bernie Sanders. 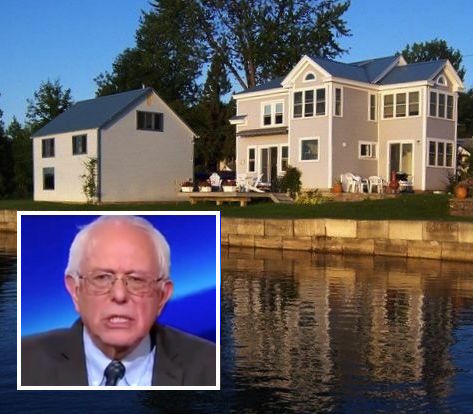 After his failed 2016 run Mr. Sanders was quite happy to buy himself a second home, some flash vehicles, and not long after, admit he had joined the millionaire class. Makes sense that if he is to build on that sudden wealth the only thing to do is to run for president again. Remarkable that there are still enough voters out there willing to be duped yet again. 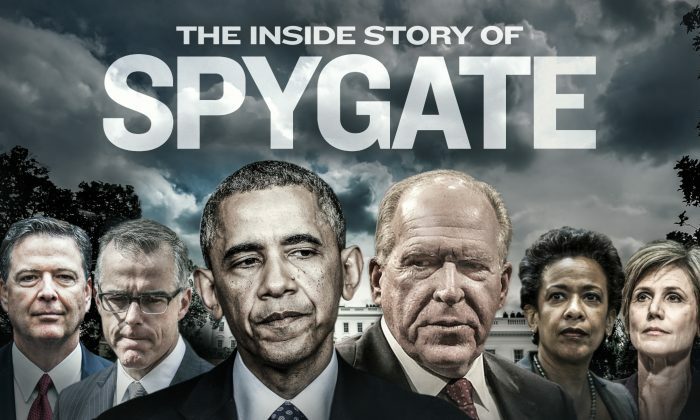 A very good summation of the Spygate scandal via The Epoch Times that makes clear what was done to President Trump and his administration was an attempted coup with links to the highest levels of the U.S. government and the Establishment Media. 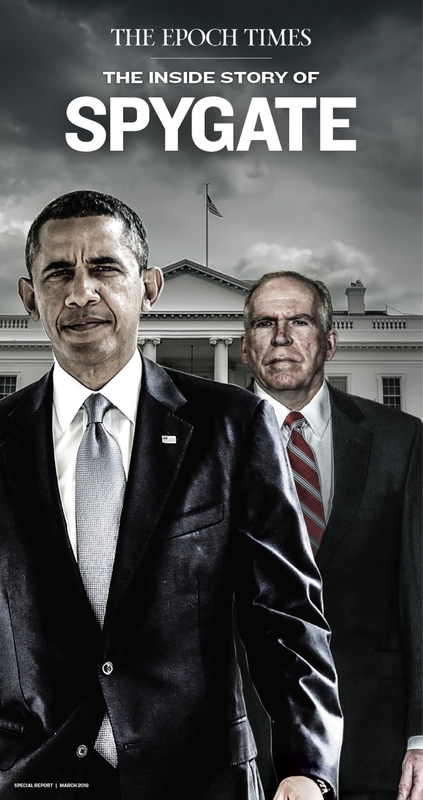 Efforts by high-ranking officials in the CIA, FBI, Department of Justice (DOJ), and State Department to portray President Donald Trump as having colluded with Russia were the culmination of years of bias and politicization under the Obama administration. Was the Obama era a truly “scandal free” eight years as is so often portrayed by the media? Hardly. 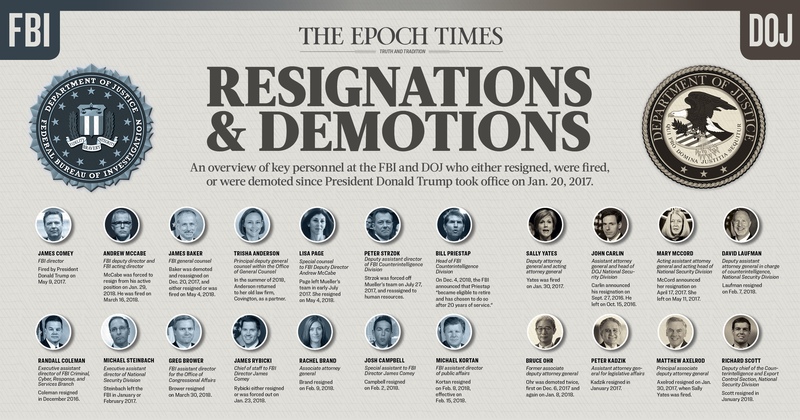 The facts say otherwise as all of the resignations and demotions of former Obama officials linked to the Spygate scandal clearly show. The real question, though, is if the major players involved will also have to face the truth of their actions. 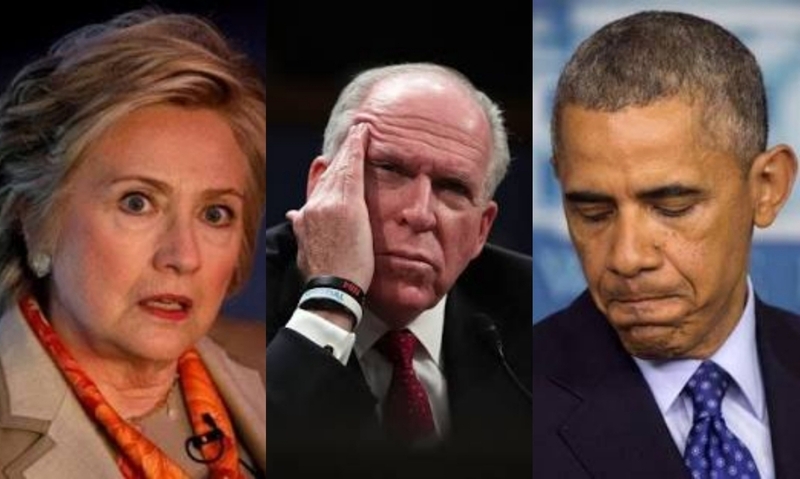 The weaponization of the intelligence community and other government agencies created an environment that allowed for obstruction in the investigation into Hillary Clinton and the relentless pursuit of a manufactured collusion narrative against Trump. A willing and complicit media spread unsubstantiated leaks as facts in an effort to promote the Russia-collusion narrative. The Spygate scandal also raises a bigger question: Was the 2016 election a one-time aberration, or was it symptomatic of decades of institutional political corruption? To understand this abuse of power, it helps to go back to July 2011, when DOJ Inspector General Michael Horowitz was appointed. From the very start, Horowitz found his duties throttled by Attorney General Eric Holder, who placed limitations on the inspector general’s right to have unobstructed access to information. Holder used this tactic to delay Horowitz’s investigation of the failed sting operation known as Operation Fast and Furious. “We got access to information up to 2010 in all of these categories. No law changed in 2010. No policy changed. … It was simply a decision by the General Counsel’s Office in 2010 that they viewed, now, the law differently. And as a result, they weren’t going to give us that information,” Horowitz told members of Congress in February 2015. On Aug. 5, 2014, Horowitz and other inspectors general had sent a letter to Congress asking for unimpeded access to all records. Deputy Attorney General Sally Yates responded on July 20, 2015, with a 58-page memorandum, titled “Memorandum for Sally Quillian Yates Deputy Attorney General,” written by Karl R. Thompson, the principal deputy assistant attorney general of the Office of Legal Counsel (OLC). “The OLC opinion’s restrictive reading of the IG Act represents a potentially serious challenge to the authority of every Inspector General and our collective ability to conduct our work thoroughly, independently, and in a timely manner. Our concern is that, as a result of the OLC opinion, agencies other than DOJ may likewise withhold crucial records from their Inspectors General, adversely impacting their work. Horowitz continued to push Congress for oversight access and encouraged passage of the Inspector General Empowerment Act. Horowitz would ultimately win his battle, but only as President Barack Obama was leaving office. On Dec. 16, 2016, Obama finally signed the Inspector General Empowerment Act into law. Ironically, the Clinton email server investigation, known as the “Mid-Year Exam,” originated from a disclosure contained in a June 29, 2015, memo sent by the inspectors general for both the State Department and the Intelligence Community to Patrick F. Kennedy, then-undersecretary of state for management. The IGs’ memo included an assessment that Clinton’s email account contained hundreds of classified emails, despite Clinton’s claims that there was no classified information present on her server. On July 6, 2015, the IG for the Intelligence Community made a referral to the FBI, which resulted in the official opening of an investigation into the Clinton email server by FBI officials Randall Coleman and Charles Kable on July 10, 2015. At this time, Peter Strzok was an assistant special agent in charge at the FBI’s Washington Field Office. The assistant director in charge at the Washington Field Office during this period was Andrew McCabe, a position he assumed on Sept. 14, 2014. On July 30, 2015, within weeks of the FBI’s opening of the Clinton investigation, McCabe was suddenly promoted to the No. 3 position in the FBI. With his new title of associate deputy director, McCabe was transferred to FBI headquarters from the Washington Field Office, and his direct involvement in the Clinton investigation began. Strzok would follow shortly. Less than a month after McCabe was transferred, FBI headquarters reached out to the Washington Field Office, saying it needed greater staffing and resources “based on what they were looking at, based on some of the investigative steps that were under consideration,” Strzok told congressional investigators in a closed-door hearing on June 27, 2018. 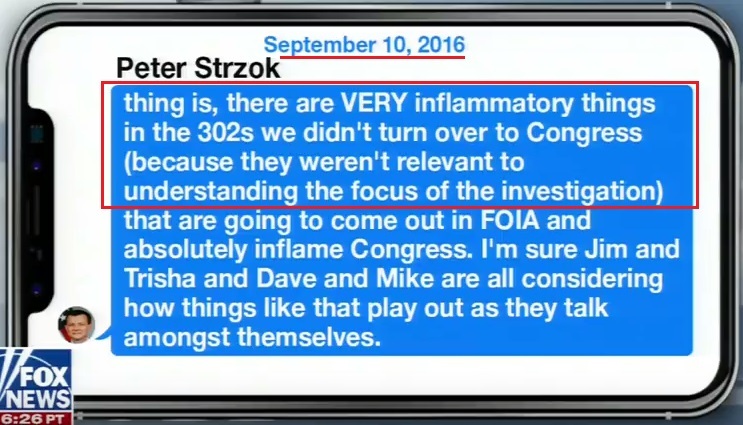 Strzok was one of the agents selected, and in late August 2015, he was assigned to the Mid-Year Exam team and transferred to FBI headquarters. Strzok, in his comments to lawmakers, acknowledged that the newly formed investigative team was largely made up of hand-picked personnel from the Washington Field Office and FBI headquarters. Dec. 1, 2015: Randall Coleman, assistant director of Counterintelligence, was named as executive assistant director of the Criminal, Cyber, Response, and Services Branch, and was replaced by Bill Priestap. Feb. 1, 2016: Mark Giuliano retired as FBI deputy director and was replaced by Andrew McCabe. Comey is the only known senior FBI leadership official who remained involved throughout the entire Clinton email investigation. McCabe had the second-longest tenure. On Jan. 29, 2016, Comey appointed McCabe as FBI deputy director, replacing the retiring Giuliano, and McCabe assumed the No. 2 position in the FBI, after having held the No. 3 position for just six months. It was at this point that FBI lawyer Lisa Page was assigned to McCabe as his special counsel. This was not the first time that Page worked directly for McCabe. James Baker, the FBI’s former general counsel, told congressional investigators that Page had worked for McCabe at various times during McCabe’s career, going back as far as 2013. 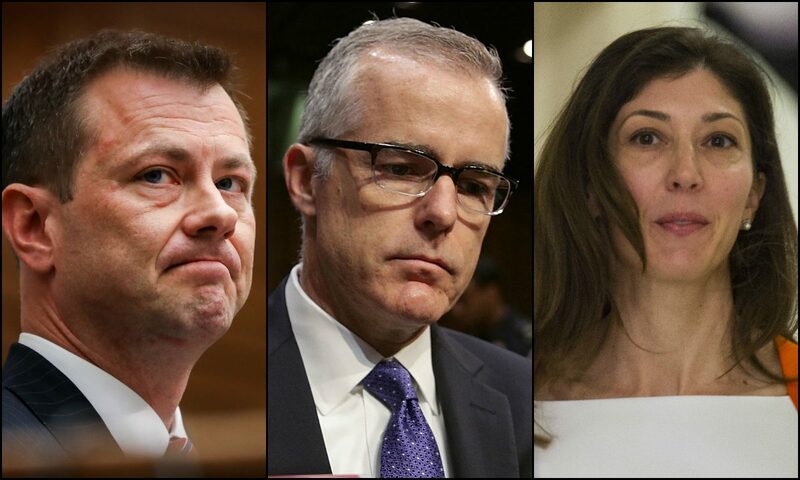 By early 2016, the three participants in the infamous “insurance policy” meeting—McCabe, Strzok, and Page—were now in place at the FBI. In January 2016, Bill Priestap was named as head of the FBI’s Counterintelligence Division, replacing Coleman and inheriting the Clinton email investigation in the process. READ THE FULL EPOCH TIMES STORY HERE AND THEN MAKE SURE TO SHARE WITH OTHERS. No other president of the modern era survived so much against so many while somehow managing to do the good work that is benefitting ALL Americans. And now, for the first time since he took office, this remarkably resilient president has his moment to fight back against those who attempted to destroy him and his America-First policies. It just gets more and more bizarre the things coming out of former Obama FBI Director James Comey’s mouth. 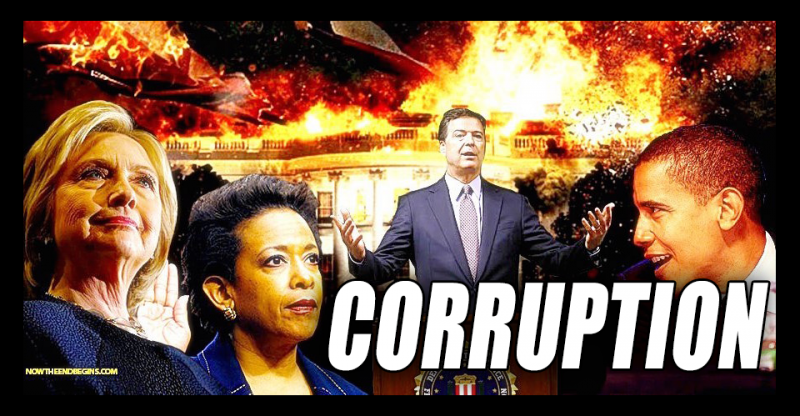 With new Attorney General William Barr doing a first time ever look at how the fake Trump Russia hoax/attempted coup was initiated, Mr. Comey is sounding more shrill and making less sense, which is doing little to lessen the growing view by many Americans that he is nothing more than a lying Deep State player of the worst kind. “That’s going to require a whole lot of conversations inside the Department of Justice. But I don’t know what he meant,” Comey said. Meanwhile, Comey touted Barr’s experience at the Justice Department. Whether proper or improper, the issue of surveillance of the Trump campaign has been widely documented. The FISA warrants, for example, were the subject of a GOP House Intelligence Committee memo last year. That memo alleged the unverified anti-Trump dossier provided much of the basis for law enforcement officials to repeatedly secure FISA warrants against Page, though Democrats have pushed back on parts of the GOP report. 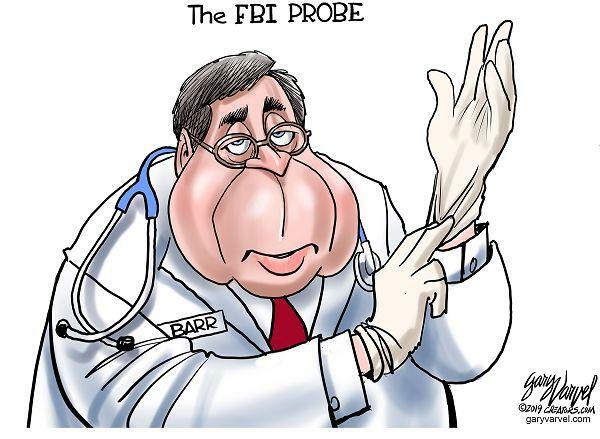 House Intelligence Committee Ranking Member Devin Nunes, R-Calif., on Thursday notified Barr of criminal referrals related to the case alleging several “potential violations” of the law. A wide-eyed and stammering Speaker Nancy Pelosi called it “unhinged” while CNN ran headline after headline declaring it “stunning” and “scary.” And what exactly has them so upset? Quite simply they fear the truth of their attempted coup of a sitting president being proven as fact by an honest Attorney General and the very serious legal implications that could then follow. When he was running for president Donald Trump promised voters his economic policies would help to make America great again. President Trump continues to deliver on that promise as jobless claims have dropped to the lowest levels in 50 years. -The number of Americans filing applications for unemployment benefits dropped to a 49-1/2-year low last week. -The data pointed to sustained labor market strength that could temper expectations of a sharp slowdown in economic growth. -Initial claims for state unemployment benefits fell 8,000 to a seasonally adjusted 196,000 for the week ended April 6, the lowest level since early October 1969. Americans Now Want To Know When Does The REAL Investigation Into Collusion Begin? Indeed. With the total collapse of the Trump-Russia hoax, and all the links that point to what might very well be the single greatest attempted political fraud of the modern era, more and more Americans are wondering if those responsible will finally be held accountable. So far President Trump’s new Attorney General is showing many times more pushback and grit than former AG Jeff Sessions and that’s a good thing for truth and accountability. This week the Attorney General faced down the attempted taunts and accusations of unhinged Democrats in a way that has left many in the Mainstream Media increasingly frustrated. The reason is simple. Truth is winning and they know that also means President Trump is winning. As per usual in these circumstances, this is an amazing thing to watch. You got all these Democrats on this committee that’s led by Serrano from New York, Jose Serrano from New York, and they got Bill Barr, the attorney general. They think they’re gonna get to the bottom because the Democrats without fake news and without conspiracies don’t have any news. They’ve got nothing going on unless they make it up or get a conspiracy. So they are convinced, they’re convinced that they’re gonna get the truth out of Barr today. They are convinced that they’re gonna put so much pressure on this guy that he’s not gonna know what hit ’em. They are convinced that Barr is going to be begging them to go easy on him after they pummel him and pummel him and get him to admit that the report says that Trump did collude with Russia, that he’s lied about it in his summary and please forgive him. “No ho! No ho-ho-ho-ho-ho! There’s got to be some collusion in there. We’re gonna find it, we’re gonna find it.” It’s been comical to watch. It’s pathetic. The Democrats are literally making fools of themselves and do not know it. They believe that they are superior. They believe and are fully convinced that there’s collusion in there and that somehow it’s being covered up and that they’re gonna be able to get Barr to reveal it. Barr is unflappable, he’s unmoved, and you know what he’s learned? I was telling Mr. Snerdley earlier, William Barr has learned to suffer fools. Some people can’t. Some people don’t have any patience with idiots, and they cannot hide the fact that they know they’re dealing with idiots. Bill Barr knows that he’s dealing with imbalanced, out-of-balance people here, but he doesn’t betray that he knows that. The Democrats are being driven mad. By the way, have you heard the phrase “handpicked attorney general Bill Barr” what cabinet secretary isn’t handpicked? They are all handpicked. And everybody in the Drive-By Media is using “President Trump’s handpicked attorney general William Barr.” Oh, you mean Jeff Sessions wasn’t handpicked? He was forced on us by Kislyak, the Russian ambassador at lunch one day? So now there’s a big move on the Democrats are criticizing Trump for packing his cabinet with loyalists. Yeah. Trump is getting grief for putting supporters on his cabinet. I guess what he’s supposed to do is hire saboteurs and have a confederacy of enemies advising him so that he will not be able to accomplish his own agenda because he’s supposed to put people in there who will not help him move it forward. I mean, this is — perverted is not the word. It’s just, these people, I keep looking for new ways to express the depths to which they have sunk. I think it’s all rooted in their abject hatred. And I think it’s resulted in severe poisoning of their emotions and of their mind. You know, at one point I thought this was a pretty good act. But it’s gone on longer than any of these people have the ability to consistently act this. I know that’s saying something, because they do have an incredible ability to act and be phony. But this has taken hold of them. …But this has been so far outside the bounds of civility and normalcy that I want to continue to call attention to it because to even characterize this as an investigation gives it a legitimacy that it does not deserve. None of this is legitimate. None of this should have ever, ever happened. There should have been at any point from the origins of this, there should have been — and there wasn’t — one person to stand up and say, “Stop this. This is a violation of law. This is a violation of our ethics. This is a violation of our representative republic. This is a violation of every American ideal we hold dear.” There wasn’t one person, that we know of that stood up and said, “Stop it.” Everybody involved in it promoted it, acted in it, sponsored it, promoted it, amplified it, egged it on. At every stage of this there should have been one Gary Cooper somewhere. There should have been a John Wayne somewhere that just stood up and said, “Stop this.” Somebody with the moral authority that when they said “stop” it would stop. But nobody did. At least we don’t know if anybody did. It continued and it continued with the approval and the support, both financial and moral, of high officials in the Obama administration and in the U.K. intelligence agencies. We were so close. Folks, I need to point out again, we had an international effort to find even a speck of dirt to disqualify Donald Trump, and nobody could. We inadvertently, the American people, we inadvertently elected the cleanest and purest citizen we’ve got. Who else in American politics could have survived an international effort to find a speck of dirt to disqualify something? They couldn’t find a single thing, even implanting spies. Now, none of us knew this. In fact, most of us voting for Trump thought we had to hold our nose about a couple things, when in fact we’ve got the cleanest and purest international citizen that we could have elected. But we came so close. So that’s why I continue to focus on this. See The Epic TRUMP 2020 Video That Has Trump Supporters Cheering! It was tweeted by the president himself with a defiant MAKE AMERICA GREAT AGAIN caption to announce its arrival, much to the chagrin of his extremist detractors. For those of you who trust the Establishment Media 100%, chances are you are currently living under the illusion/delusion that hate crimes in Trump’s America are rising at a pace never before seen. In fact, what is actually ‘exploding’ in this regard are hate crime hoaxes and some widespread manipulation of the statistical data. Law enforcement reported 7,175 hate crimes to UCR in 2017, up from 6,121 in 2016. Although the numbers increased last year, so did the number of law enforcement agencies reporting hate crime data—with approximately 1,000 additional agencies contributing information. The report, Hate Crime Statistics, 2017, includes hate crime information for last year, broken down by location, offenders, bias types, and victims. If you’ve fallen for the ‘hate crimes are increasing’ hoax, don’t feel bad. That’s what the manipulators wanted and they’ve been at this sort of thing for a very long time. The fact is, given how the reporting data has been so manipulated, it is quite possible that overall hate crimes have GONE DOWN since 2016. **Just before the 2016 election, the 111-year-old Hopewell Baptist Church was attacked with fire and graffiti that said, “Vote Trump.” “The political message of the vandalism is obviously an attempt to sway public opinion regarding the upcoming election,” said Rep. Bennie Thompson (D-Miss.). Turns out the arsonist was Andrew McClinton, 48, an African-American member of the church. **Yasmin Seweid, 18, told police that three Donald Trump supporters harassed her and tried to steal her hijab on a No. 6 train in New York City. But the Dec. 1, 2016, alleged hate crime fell apart two weeks later when Seweid admitted she made the whole thing up because she’d been out late drinking with friends and was afraid her strict Muslim Egyptian father would be angry. **More than 2,000 bomb threats to Jewish institutions, including the Israeli Embassy in Washington, DC, were made in the first three months of 2017. “My personal take is it’s a statement of where we are in this country,” Michael Feinstein, the chief executive of the Bender Jewish Community Center of Greater Washington, in Rockville, Md., told The Times. In March 2017, an arrest was finally made in many of the incidents: that of a 19-year-old Jewish Israeli-American named Michael Ron David Kadar. Kadar had been rejected from the Israeli Defense Forces over mental health issues and claimed in his defense that he had a brain tumor. A few of the threats didn’t come from the Jewish teenager. At least eight were the work of Juan Thompson, 32, who was trying to frame a woman who had broken up with him. Thompson, a black journalist, had previously been fired from The Intercept for making up sources and stories. In response to his firing, he blamed the “white New York media” and claimed his editors were racist. **Forty-two Jewish tombstones were toppled in Washington Cemetery in Midwood, Brooklyn, in March 2017. While officials were worried it was an anti-Semitic act, after an investigation, the NYPD named another suspect: the wind. “[It was] due to neglect, or weather factors like soil and dirt and wind. There is no evidence to suggest this was a case of vandalism,” a police spokesman said. **African-American Adwoa Lewis, 20, of Long Island said four teens yelled “Trump 2016!,” told her she didn’t belong here and slashed her tires in September 2018, leaving a note that read “Go Home.” She later admitted to making the story up and putting the note on her car. **Union Temple in Brooklyn was defaced by messages such as, “Die Jew Rats” and “Jew Better Be Ready” in early November 2018. The culprit? Gay African-American James Polite, who had previously interned for City Council Speaker Christine Quinn and was raised by Jewish foster parents. He was charged for hate crimes for the graffiti and setting fires at four other Jewish temples and schools. But friends and advocates say bigotry isn’t to blame; Polite is bipolar and was convinced that the FBI and CIA had taken over the city’s homeless shelter system. **On Dec. 30, 2018, a 7-year-old African-American girl, Jazmine Barnes, was killed in a drive-by shooting. Witnesses said a white man in a pickup truck was nearby. “We’ve got to call it what it is. Black people are being targeted in this country,” said activist Deric Muhammad. Rep. Sheila Jackson Lee (D-Texas) insisted, “Do not be afraid to call this what it seems to be — a hate crime,” But the investigation led to the arrest of two African-Americans, Eric Black Jr. and Larry D. Woodruffe, who police believe shot into Barnes’ car in a case of mistaken identity. **This past New Year’s Eve, three Savannah churches and a civil rights museum were vandalized, raising the specter of a hate crime. But it was an African-American, David Smith III, who had thrown bricks through the doors. 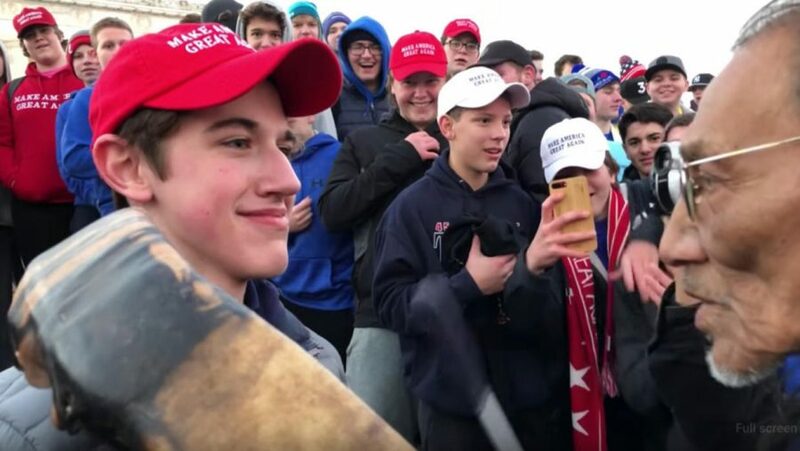 **Video went viral of a Jan. 18 confrontation at the March for Life in Washington, DC, showing a group of students from Covington Catholic HS in Kentucky, some in MAGA hats, in a confrontation with a Native American, Nathan Phillips. “They were in the process of attacking these four black individuals,” Phillips told the Detroit Free Press. “I was there, and I was witnessing all of this … As this kept on going on and escalating, it just got to a point where you do something or you walk away, you know? You see something that is wrong, and you’re faced with that choice of right or wrong.” Other videos quickly proved that Phillips was lying. A group of Black Israelites was taunting the Covington teens with racial insults such as, “Christ is coming back to kick your cracker asses.” And Phillips wasn’t surrounded by the Covington students; he walked into the group and started banging a drum in the face of one of the kids, whose bewildered expression had online commentators quick to label a smirk. A lawyer for a Covington student has filed a defamation suit against the Washington Post for $250 million in damages. Now here is where your blood might really get boiling as you realize how far down the hate crime hoax rabbit hole you allowed yourself to fall. 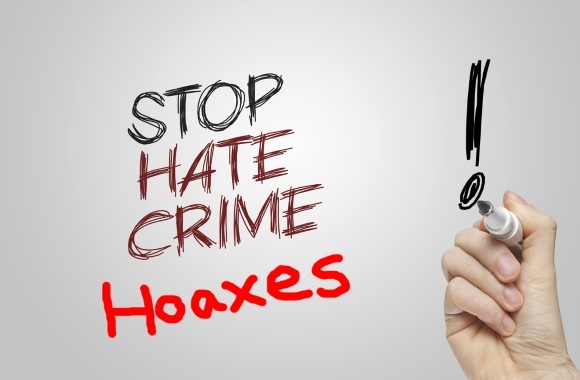 All of the above hoaxes listed above, and the many-many more similar hate crime hoaxes that have taken place and are not on that list, ARE ALL INCLUDED IN THE OVERALL HATE CRIME REPORTS STATISTICS. The FBI does not differentiate between actual hate crimes reported and hoax hate crimes reported – they are all included as the same in creating the “Hate Crimes Increase By 17%” headline. And what is the result of this dangerous hoax? More Americans become more divided and our politics increasingly radicalized. It’s shameful, it’s destructive, and in the end, it is tearing this country apart. Do racism and bigotry exist in America? Of course. There are white racists, black racists, red, white, and blue racists. Racism and bigotry are the byproducts of ignorance and yet it is the fake hysteria machine perpetrated by the media and race-baiting politicians who are working to keep Americans ignorant of a far different reality—a reality where our differences are in fact few and our similarities many. DON’T FALL FOR THE FAKE HATE. Stand with reason. Stand with love and respect for all of humanity because that is where the real power of the people is found and it is that power the politics of division fear most. While most with reasonable amounts of both sense and sensibilities realize the Obama White House had to have been intimately involved in both the creation and dissemination of one of the single greatest political hoaxes in U.S. history, proving it is another matter. 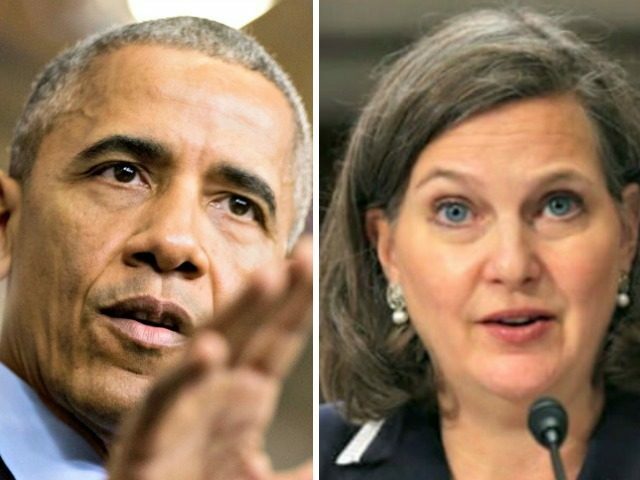 Victoria Nuland, President Obama’s assistant secretary of state for European and Eurasian Affairs from September 2013 until January 2017, has been linked to the notorious anti-Trump dossier fabricated by Hillary Clinton’s opposition research firm. To understand better how the dossier’s spurious charges were spread around the Obama administration, Judicial Watch filed a Freedom of Information Act (FOIA) lawsuit against the U.S. Department of State for communications between Nuland and employees of Fusion GPS, as well as top ranking Department of Justice, FBI, and State Department officials. [Steele] passed two to four pages of short points of what he was finding. And our immediate reaction to that was, this is not in our purview. This needs to go to the FBI if there is any concern here that one candidate or the election as a whole might be influenced by the Russian Federation. That’s something for the FBI to investigate. And that was our reaction when we saw this. It’s not our – our – we can’t evaluate this. Judicial Watch intends to find out how far the Deep State was willing to go in their effort to discredit then-candidate Donald Trump. There clearly was an Obama administration no-holds-barred attempt to clear the path to the presidency for Hillary Clinton. Judicial Watch’s FOIA lawsuits have already shown the Obama State Department was corruptly targeting President Trump. Judicial Watch already exposed elements of the plot when we released 42 pages of heavily redacted State Department documents containing classified information that was provided to Senator Ben Cardin (D-MD), top Democrat on the Senate Foreign Relations Committee and outspoken critic of President Donald Trump. The documents show Russian political interference in elections and politics in countries across Europe. And then they released more heavily redacted State documents showing classified information was desperately sent to multiple U.S. Senators by the Obama administration immediately prior to President Donald Trump’s inauguration. The documents reveal that among those receiving the classified documents were Sen. Mark Warner (D-VA), Sen. Ben Cardin (D-MD), and Sen. Robert Corker (R-TN). All present facts point to Victoria Nuland acting on behalf of the Obama White House in helping to set up and further orchestrate the Trump-Russia hoax—and she is most likely far from the only one. This is why Democrats and their media cohorts are now so desperate to attempt yet another distraction via more and more taxpayer-funded investigations into the president’s taxes, business dealings, his children, etc. They want the media distraction machine working at full capacity on their behalf should more and more Americans become less ignorant and see them for what they really are—utterly corrupt, power-hungry politicians who have long been selling the safety and security of America and her people to the highest bidder. Make no mistake, there will be more attempts to destroy the Trump presidency. He has fought so very hard for you. Are you prepared to fight just as hard for him? Democrats and the media have been mischaracterizing President Trump’s comments from the beginning even as more and more Americans have become less ignorant of that fact. That’s a big reason why the president’s approval ratings continue to go up even as ratings for such anti-Trump media outlets like CNN continue to collapse. The left and its compliant media are willfully reporting false news to the American people. Whether it is a symptom of mass hysteria that is the genesis for this confirmation bias-style reporting or an intentional maneuver to spread anti-Trump propaganda, its effect is toxic and pernicious. In truth, the video is almost a year old. Last May, during a meeting with the president, Sheriff Margaret Mims of Fresno County, Calif., explained to Trump that she was frustrated over that state’s restrictive immigration sanctuary policies. “There could be an MS-13 member I know about — if they don’t reach a certain threshold, I cannot tell ICE about it,” she told Trump. The New York Times, Washington Post and Associated Press all piled on. That was last year but here we go again. On and on the list goes. Tweets and retweets of misinformation. Millions of Americans will believe what they have read and look on their neighbors as suspect. Americans can tweet what they want. 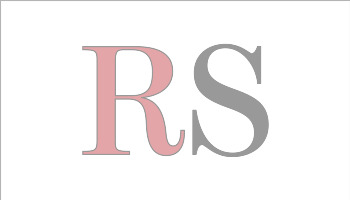 Reputable media personnel, however, are entrusted to be the conveyors of truth. They constantly declare their import with screeds about the First Amendment. Those in media who propagated this toxic lie should be fired. 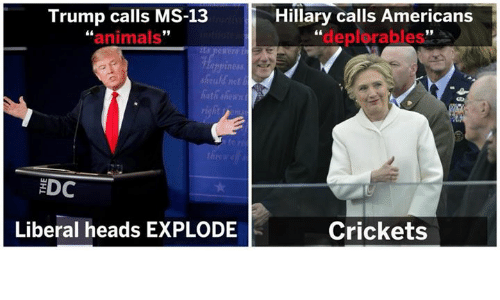 And here is the real truth regarding the elitist media and politicians taking the president’s comment that MS-13 gang members are ‘animals’ and lying by then saying he was describing all illegals as animals. MS-13 is decimating minority communities all across America – the very same communities President Trump is working hard to save and revitalize and that Democrats have ignored for decades. You see, Democrats and the media don’t actually care about minorities, the poor, those suffering in neighborhoods corrupted by dangerous criminals. They only see those people and their problems as potential political tools that only exist to provide liberal political and media talking points/lies. Unlike so many others in DC and throughout the media, President Trump refuses to ignore the problem of community-destroying gang-related violence. And how do D.C. politicians and their media cohorts respond to that effort? By lying about the president’s words in their ongoing effort to portray him as racist. Think about that. The president who is actually fighting to make minority communities in America safer, who has overseen a dramatic improvement in minority unemployment, business startups and homeownership, and who has already greatly improved a criminal justice system that for too long hurt minorities, is being called a racist by the very same media and politicians who did nothing to try and solve those problems. President Trump’s enemies are counting on there being enough ignorant voters that their lies will be rewarded come Election Day. It’s up to all of you to prove them wrong. Q: How Many Russians Does It Take For Hillary Clinton To Lose An Election? …Obama had been called out by the Drudge Report for visiting foreign leaders in Europe in the spring of 2017 right before President Trump visited those leaders in Europe. It turns out that one of those Obama meetings is now under scrutiny on Capitol Hill. Now we know: the country is Germany and the foreign agent was either Angela Merkel or someone who worked for Angela Merkel in foreign intelligence. The redacted sections will be referencing one of the European countries and agents that share SIGINT (signal intelligence) to US Intelligence,” says Chuck Marler, a longtime agent of the FBI Special Surveillance Group under Robert Mueller, who is an official whistleblower in this case. 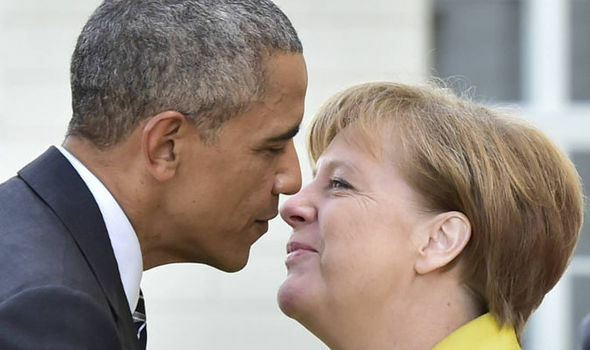 If anyone wishes to believe the above information being disseminated had no connection to the suddenly scheduled private meeting between Barack Obama and Angela Merkel (to say nothing of the Logan Act implications) then ignorance truly is bliss. 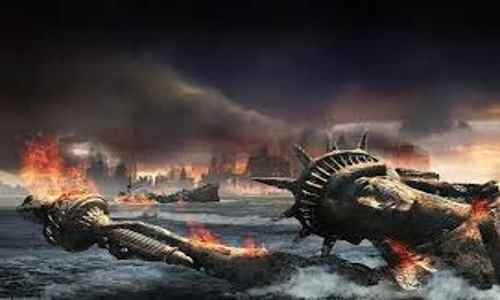 The rest of you, though, should start to see a more clear picture of exactly what is going on now as it relates to what transpired then—the attempted coup of a sitting president by Deep State powers that share connective tissue all across the globe. You want to know about REAL collusion with foreign powers? This video is from about twenty years ago and is an almost shocking reminder of how America was once a nation where people of differing views and opinions could sit down and talk in a respectful manner without all of the hyper-emotionalism that plagues our society today. This is pre-social media of course where minor differences were not blown up into “movements” that in the end only work to further divide people as is so often the case today. 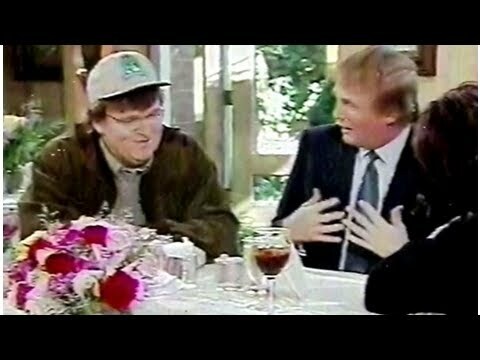 It’s a video that also reveals just how intelligent and caring Donald Trump was – and is. And make no mistake, this is the America President Trump is working so hard to return to us while his political enemies in D.C. and throughout the Establishment Media want to further divide and weaken the nation. This is the information the Establishment Media has been working very hard to ignore in order to keep enough Americans ignorant so as to avoid justified marching in the streets of D.C.
And know that this isn’t the first time the Deep State has directly attempted to manipulate an election outcome. 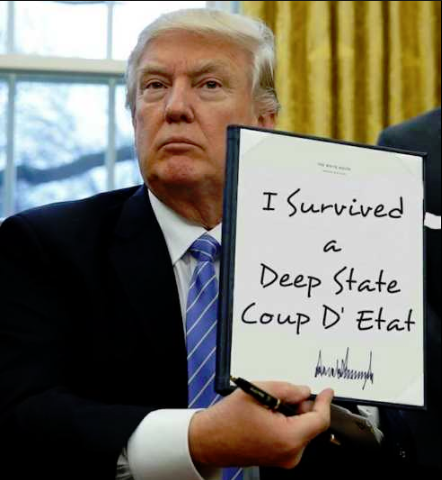 It’s just that this time because President Trump fights so hard, refuses to give up, and his tens of millions of supporters stand by him, that the Deep State was caught in the act. The “Operation Crossfire Hurricane” plot against President Donald Trump is now exposed for the world to see, with special counsel Robert Mueller coming up empty in his quest to pin Trump with Russian collusion or obstruction of justice. We have explosive information about this scheme, including the involvement of former president Barack Obama, Obama intelligence officials John Brennan and James Clapper, failed Democrat presidential candidate Hillary Clinton, disgraced FBI agent Peter Strzok, the Fusion GPS set-up agent Natalia Veselnitskaya, and even foreign leaders including Angela Merkel. -Natalia Veselnitskaya was a Fusion GPS set-up agent who worked out of an Obama official’s office in D.C. The Hillary Clinton campaign issued a press release on September 24, 2016, promoting information from the Christopher Steele dossier. That press release has almost completely been scrubbed from the Internet but is preserved in at least one tweet and in an Internet archive sponsored by The American Presidency Project. Obama administration Director of National Intelligence James Clapper held a meeting in his last days in office to discuss the idea of going to a Supreme Court justice to block President Donald Trump’s inauguration, according to a high-level member of the intelligence community who spoke with a Big League Politics source. The U.S. Attorney’s office for the Southern District of New York, then led by anti-President Trump activist Preet Bharara, played a key role in getting Natalia Veselnitskaya into the country in 2015-2016 on special Obama administration passes. Now, fired U.S. Attorney Bharara’s former office has charged Veselnitskaya with obstruction of justice in an unrelated case. They did this to force Natalia to remain in Russia and not come back to the United States to testify, according to high-level FBI sources. Why? Because Natalia has made it clear that she knows Glenn Simpson — the Fusion GPS head she had dinner with the night before and the night after her Trump Tower set-up meeting — and she has said that her Trump Tower meeting with Don Jr. had nothing to do with Hillary Clinton. Robert Mueller, Bharara, and the anti-Trump conspirators want to focus on Michael Cohen as a witness and block out any witnesses that would unravel their entire invented narrative — like Natalia, the spy who was used to set up the phony meeting that led to the fraudulent FISA warrants on the Trump team. The Department of Homeland Security confirmed that Veseltnitskaya gained parole into the United States during the Obama administration due to a DHS decision made “in concurrence with the U.S. Attorney’s Office of Southern District of New York,” then headed by Preet Bharara. But the very people who wanted to get Natalia in now very much want to keep her out. Natalia Veselnitskaya was charged with obstruction of justice Tuesday to prevent her from coming back to the United States to testify in the Robert Mueller-related cases because her statements have already contradicted Mueller’s narrative, according to high-level FBI sources. Veselnitskaya, who is now in Russia, was charged for making a “misleading declaration” in a civil money-laundering case. Veselnitskaya’s indictment was filed in federal court in Manhattan and unsealed by the U.S. Attorney’s Office in the Southern District of New York, formerly led by anti-Trump activist Preet Bharara and still dominated by his underlings. Now Veselnitskaya can’t return to the United States to contradict the Michael Cohen-focused case, because she would be arrested upon her arrival in this country. So what could Veselnitskaya spill if she testified? For one thing, Fusion GPS has tried to claim no knowledge of Veselnitskaya’s Trump Tower meeting, despite the fact that Veselnitskaya had dinner with Fusion GPS chief Glenn Simpson the night before the meeting and also the night after the meeting. Geoffrey Berman, the U.S. attorney who signed the Veselnitskaya indictment, was recused from the Michael Cohen case by Department of Justice officials working under Rod Rosenstein. Berman is identified in the press as a Trump appointee but he is actually a Jeff Sessions appointee. “Mueller’s team of partisans has a problem. They want to get Trump Jr. and Jared Kushner so they are working hard to prove that Jr and Kushner lied about the June 9th 2016 Trump Tower meeting. The Special Counsel has their version (Fusion GPS’ version) of what happened in the meeting but Veselnitskaya and Manafort’s versions don’t support their version. They tried to squeeze Manafort into reciting their version but in the end he resisted. So they claimed to the Judge that Manafort lied in his proffer to them. Veselnitskaya already met with Senate investigators and gave testimony about the meeting. This testimony doesn’t fall in line with the Special Counsel’s version so they have to discredit her and keep her from coming to the U.S. for any future hearings hence the strange indictment today by holdovers of Preet Bharara. The Trump Tower meeting, facilitated by Fusion GPS and debriefed by Fusion GPS, was an original attempt to get candidate Trump to make commitments to Russia regarding the subversion of the Magnitsky Act. This was the original purpose of the entrapment but candidate Trump didn’t fall for it. So they didn’t want a good set-up to go to waste. The Russian lawyer Natalia Veselnitskaya who set up Don Trump Jr. for a meeting in Trump Tower as part of a Fusion GPS plot was operating out of the Washington offices of Cozen O’Connor, a law firm run by an anti-Trump former Obama administration official whose super PAC donated to Hillary Clinton and Jeb Bush in the 2016 presidential election. Veselnitskaya’s work from the Cozen O’Connor office provides more evidence of a Democrat and establishment Republican effort to set up the Trump campaign for a future Russian collusion case. Veselnitskaya was allowed into the United States by the Obama Department of Justice while the former Obama official who runs Cozen O’Connor publicly warned then-candidate Trump that if he became president he would be investigated by the DOJ for contacts with foreign leaders. Veselnitskaya reportedly had dinner meetings with Fusion GPS chief Glenn Simpson the day before she met in Trump Tower and also the day after she went inside Trump Tower. Big League Politics has confirmed that a Cozen O’Connor partner who lives in the same apartment building as James Comey’s friend Daniel Richman — who leaked classified information to the press on Comey’s behalf — spoke with Richman during the period that Comey and the Fusion GPS team were trying to obtain FISA warrants on Trump Tower. Russian and U.S. citizen Rinat Akhmetshin, a Soviet military veteran, was present at Veselnitskaya’s meeting with Don Jr. in Trump Tower after leading a lobbying push supposedly to repeal the Magnitsky Act. Akhmestshin is believed by insiders to be linked to Russian government intelligence, a fact that the Washington Post seized on when reporting that he met with Don Jr. and Jared Kushner in Trump Tower. A nonprofit group focused on promoting Akhmetshin and Veselnitskaya’s cause to lawmakers actually hired Cozen O’Connor, which the law firm confirms. “In the spring of 2016, as the presidential race was heating up, Akhmetshin and lobbyists he hired sought meetings on Capitol Hill to make their case against the sanctions law. Akhmetshin hired former Democratic congressman Ron Dellums, along with a team of lobbyists from the law firm of Cozen O’Connor. Steve Pruitt, a business colleague speaking on Dellums’s behalf, said his involvement was brief and ended when he determined that Congress was unlikely to change the law. 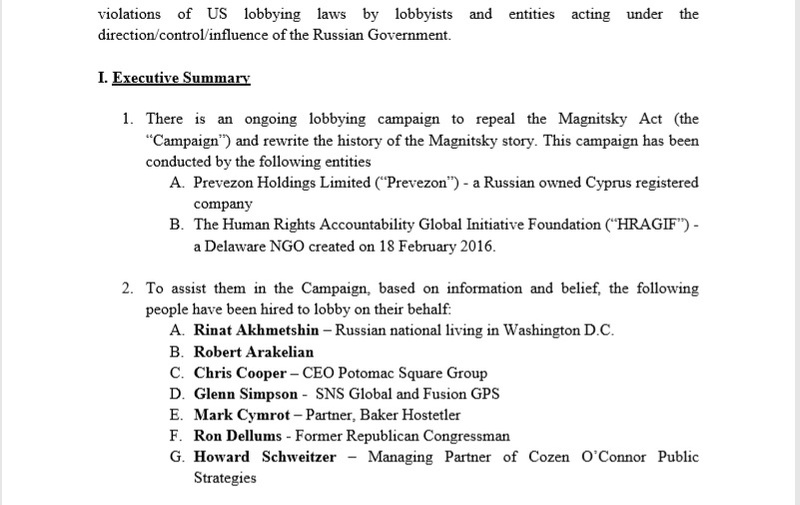 Cozen O’Connor managing partner Howard Schweitzer is listed here on a DOJ form from an investigation into the breaking of lobbying laws by Russians trying to repeal the Magnitsky Act — which was just a front to get Russians in the room with Don Jr. We know now that Natalia Veselnitskaya was actually operating out of the Cozen O’Connor offices. Schweitzer worked as general counsel for the Export-Import Bank under George W. Bush and was chief operating officer of the TARP bailout program under both Bush and Obama from 2008-2009. The narrative was being set. 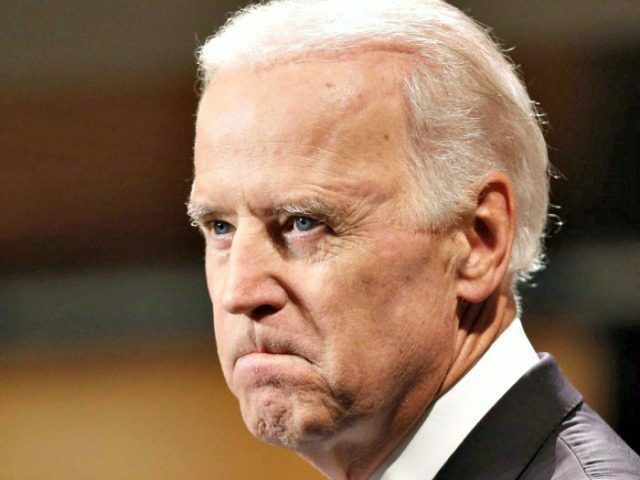 The Philadelphia-based Cozen O’Connor law firm also has a political action committee that donated to Hillary Clinton during the 2016 presidential election, in addition to Jeb Bush, Chris Christie, John Kasich, and Martin O’Malley. In the 2018 election cycle, the Cozen O’Connor PAC donated more money to Hillary Clinton’s dormant campaign. Cozen O’Connor’s connections to the anti-Trump “Operation Crossfire Hurricane” plot are wide-ranging, and show up in unexpected places. James Comey’s friend, Columbia University professor Daniel Richman, leaked classified information that Comey gave him. During this leaking period, Richman was apartment-building neighbors with a partner at the Cozen O’Connor law firm that strategized with Fusion GPS operative Natalia Veselnitskaya, the Russian plant who set up Don Jr. in Trump Tower. 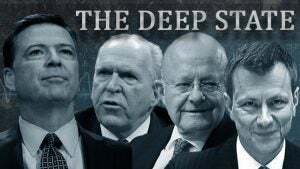 Veselnitskaya and Fusion GPS, led by Glenn Simpson, were part of John Brennan and Peter Strzok’s CIA-led “Operation Crossfire Hurricane” plot aimed at President Donald Trump and the Trump campaign. “Yes, he is my neighbor,” Amy Wenzel, a partner at Cozen O’Connor, confirmed in a phone conversation with Big League Politics, confirming that they spoke. They live near each other in a Brooklyn high-rise. The Washington Post’s release of Trump Tower documents shows the crowd surrounding non-sexual honeypot Natalia Veselnitskaya. The crowd of conspirators knew they were damaging Trump by setting up the meeting. The Post confirms British-citizen music promoter Rob Goldstone’s testimony to the Senate Judiciary Committee, in which he described the conspirators’ push to get the meeting despite the fact that they knew it would create trouble for the Trump campaign. “Rob Goldstone told the committee that his client, the Russian pop star and developer Emin Agalarov, had insisted he help set up the meeting between President Trump’s son and the lawyer during the campaign to pass along material on Clinton, overriding Goldstone’s own warnings that the meeting would be a bad idea. “He said, ‘it doesn’t matter. You just have to get the meeting,’ ” Goldstone, a British citizen, testified. Natalia Veselnitskaya is also inextricably linked to the case against Paul Manafort. The Russian attorney partner of Paul Manafort who was named as a defendant in Robert Mueller charges is also linked to the Russian spy Natalia Vesenilskaya, who attended a meeting with Don Trump Jr. and Jared Kushner in Trump Tower. According to Mueller’s charges, Manafort’s Russian partner Konstantin Kilimnik tried to intimidate or coerce witnesses in Manafort’s upcoming money laundering trial. That put Konstantin Kilimnik at the center of the Mueller effort to find obstruction of justice in Trump-World. So who is Konstantine Kilimnik? It turns out that Kilimnik is linked to Veselnitskaya, the Fusion GPS agent, according to Senate documents. Documents reveal Kilimnik’s ties to Veselniskaya. Let’s take a look at United States Senate Judiciary Committee documents questioning Veselniskaya in October. Judiciary Committee chairman Sen. Chuck Grassley and Ranking Member Sen. Dianne Feinstein asked Veselniskaya if she knew a handful of characters believed to be conspirators in the case. Grassley and Feinstein specifically asked Veselnitskaya if she knew Konstantin Kilimnik. Former Attorney General Jeff Sessions was a member of the Senate Judiciary Committee as a senator from Alabama. 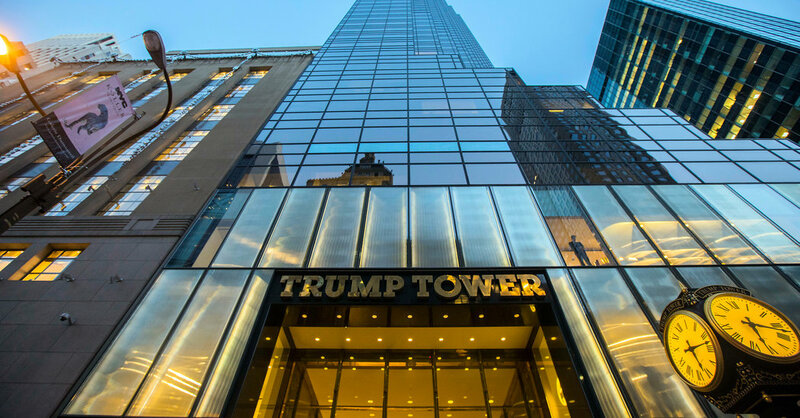 Veselnitskaya’s meeting with Don Jr. in Trump Tower provided some of the basis for warrants to surveil Trump Tower and for other FBI surveillance measures on the Trump campaign. The fact that Veselnitskaya, a lawyer herself, was in the meeting with Trump Jr. and Kushner opened the president’s son and son-in-law up to being qualified as “target associations” for law enforcement under Section 702 of the FISA Amendments Act of 2008, passed during the Bush administration. Veselniskaya’s link to suspected conspirator Kilimnik is now coming under scrutiny. Peter Strzok, meanwhile, is firmly established as the go-to guy who ran point on the entire operation. Both John Brennan and James Comey used Peter Strzok to damage President Donald Trump. Strzok is the disgraced FBI agent and fired Robert Mueller team member whose text messages with mistress Lisa Page form the biggest scandal in FBI history. The lovers conspired to illegally bring down Trump, all while the FBI was spying on the Trump campaign. Strzok interviewed Hillary Clinton without putting her under oath, and granted immunity to Cheryl Mills and Clinton’s other associates right before he flew to London to meet with Christopher Steele to work on the anti-Trump dossier, which was sponsored by the Clinton-funded firm Fusion GPS. That dossier was used to fraudulently obtain FISA warrants to surveil Trump Tower. Barack Obama read bits of the dossier in his daily presidential briefings, courtesy of Brennan. Fusion GPS, meanwhile, sent operatives into Trump Tower to entrap Don Jr. and Jared Kushner in a meeting with planted Russians. When it was time for the conspirators to focus on Trump campaign adviser George Papadopoulos, Strzok was there to run information about the adviser to the Australians. When it was time to take out Trump’s national security adviser General Michael Flynn, Strzok was there to stage an “ambush” interrogation of Flynn without Flynn’s lawyer present. Brennan hired Strzok to write the Intelligence Community Assessment (ICA) in January 2017. This was an official document used to spur on the Robert Mueller investigation. 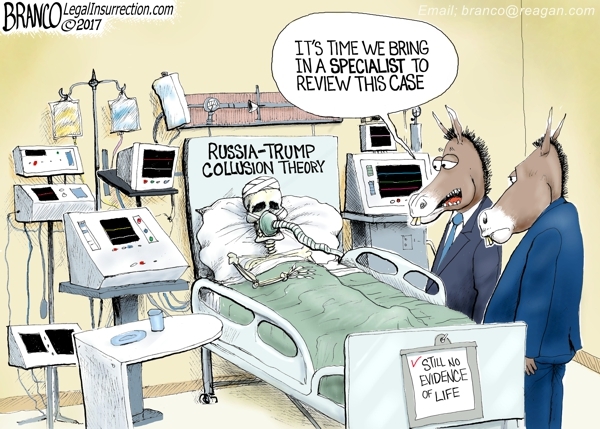 But the document did not actually find any evidence of collusion between Trump and Russia, it merely said that Vladimir Putin “aspired” to help Trump and that Russia “developed a clear preference for Trump.” The Christopher Steele dossier was added as an “appendix” to the ICA report, even though Brennan lied and told Congress that it was never used. George Papadopoulos was surveilled in real time by the FBI. Who set him up? Peter Strzok, whose meeting with the Australian ambassador in London provided key basis for the creation of Robert Mueller’s investigation, according to none other than the New York Times. “The FBI sent counterintelligence agents, one of whom was Peter Strzok, to London in the summer of 2016 to meet with Australian ambassador, Alexander Downer, to describe his meeting with Trump campaign advisor, George Papadopoulos. 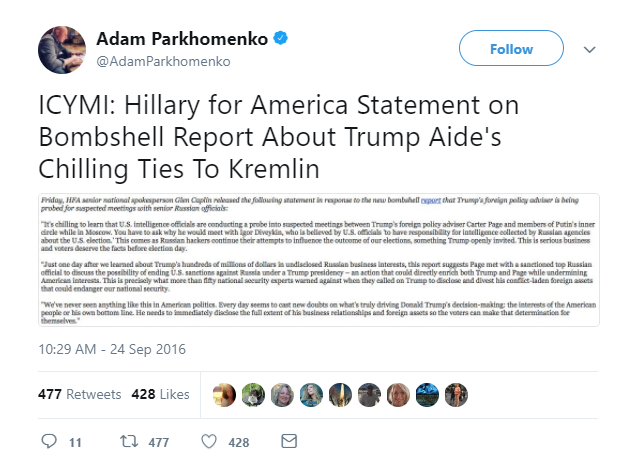 Big League Politics called attention in July 2017 to the fact that Strzok was serving on the Mueller team after personally overseeing the Hillary Clinton email investigation at the FBI and personally conducting the interview with Hillary Clinton that was not under oath and which led to no incarceration for the Democrat candidate. With the pressure on, Strzok’s wife Melissa Hodgman, Associate Director of the enforcement division of the Securities and Exchange Commission, is scrubbing her Obama and Clinton links. Hodgman was promoted by Obama just two weeks before FBI director James Comey re-opened the investigation into Hillary Clinton’s email scandal in 2016, leading political insiders to suspect that Hodgman might have been involved in the federal government’s cover-up. 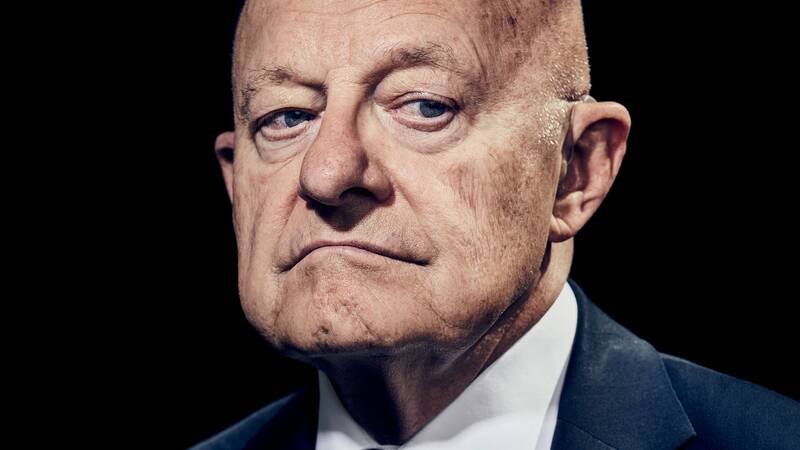 A whistleblower case currently in federal court in Washington, D.C. stands to bring out incredible allegations of John Brennan and James Clapper’s moves against Trump, Supreme Court Chief Justice John Roberts, and the former presiding judge of the FISA court Reggie Walton. House lawmakers are zeroing in on a meeting that German chancellor Angela Merkel held with President Obama at a key moment as one of the FISA warrants against Trump was set to expire. Lawmakers are aware of the role of foreign governments in collaborating with U.S. intelligence agencies in the Trump investigation as recently as 2017. Obama had been called out by the Drudge Report for visiting foreign leaders in Europe in the spring of 2017 right before President Trump visited those leaders in Europe. It turns out that one of those Obama meetings is now under scrutiny on Capitol Hill. So Germany helped build the dossier. 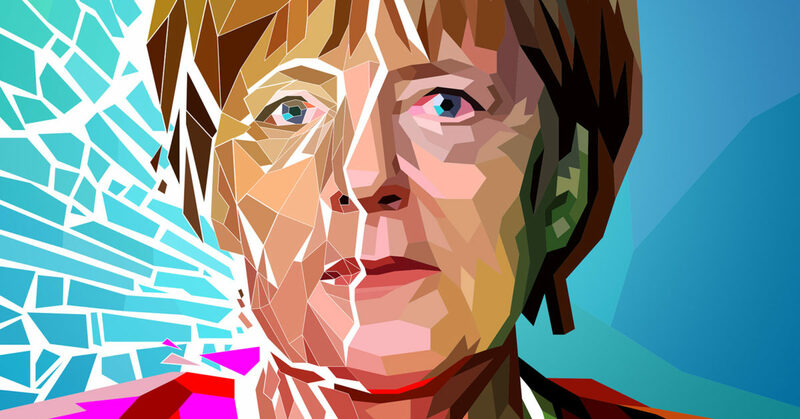 When does Merkel re-emerge in this picture? “Fast forward to April/May 2017, roughly the same time the fourth and final FISA warrant was running out (because the Carter Page story was determined false). Rosenstein and McCabe were in desperate need of renewed help from intelligence to keep the Russian Collusion narrative alive,” Marler reports. “Barack Obama is to visit German Chancellor Angela Merkel in Berlin on his first trip to Europe since leaving office. The former US President will travel to Germany for the launch of a summer of special events to mark the 500th anniversary of the Protestant church. He will arrive in Germany on the same day as his successor Donald Trump is due in Brussels for a meeting with other NATO leaders – the first scheduled foreign visit for the President since taking office. Putting whatever politics you might hold aside, how can anyone not get a kick out of our current President of the United States? The man has taken vast amounts of incoming from the media and political establishments since declaring his candidacy in 2015 and yet has never stopped laughing, has never stopped believing in America’s great potential and the even greater potential of ALL its people. OUCH! Tucker Carlson Ratings Beat ALL Of CNN’s Ratings – COMBINED! Now there’s a blowout and then there’s a BLOWOUT. Tucker Carlson is thumping the entirety of CNN’s evening lineup – combined and by a MILLION viewers. Fox News’ Tucker Carlson absolutely dominated CNN last week, beating their entire prime time line up combined in total viewers by over 1,000,000 viewers — and CNN is not handling the news well. CNN’s entire prime time line up garnered 2,474,000 total viewers compared to Carlson’s 3,475,000 total viewers. Fox News’ ratings exploded last week after Attorney General William Barr sent his letter to Congress saying that Special Counsel Robert Mueller’s investigation found no collusion between the Trump campaign and Russia. After Stelter’s claim was widely mocked, CNN launched a new attack on Fox News, specifically targeting Carlson — after Carlson dominated their entire prime time line up. CNN’s report promoted the attacks against Carlson from far-left Media Matters, despite the fact that Media Matters’ president came under intense fire last month after it was revealed that he wrote multiple racist, anti-Semitic, and transphobic things before running Media Matters. Over the last month, Tucker Carlson’s commercial breaks have had only a smattering of ads from lesser-known brands. It might be a new normal for the Fox News host, who has endured ad boycott campaigns since he made racist remarks on immigrants in December. Aside from CNN’s non-stop coverage of Russia over the last two years and its overwhelmingly negative coverage of Trump, CNN also has a serious credibility problem as surveys have found that they are viewed as the least trustworthy cable news network. Carlson responded to the far-left’s attempts to silence him in a fiery statement on Fox News, saying: “One of the only places left in the United States where independent thoughts are allowed is right here, the opinion hours on this network. Just a few hours in a sea of television programming. It’s not much, relatively speaking. For the Left, it’s unacceptable. They demand total conformity. Then again if he did nothing wrong why would he fear an investigation into the investigators? 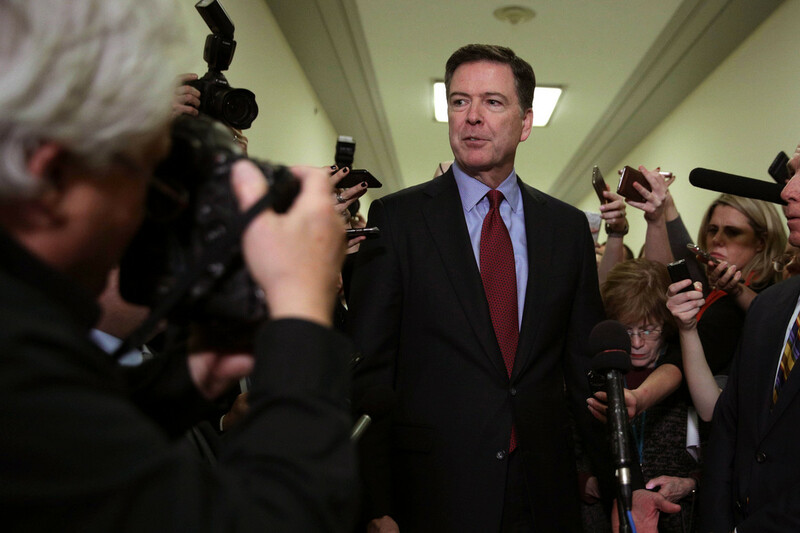 It’s far more likely James Comey was integral to the Trump-Russia hoax that was in fact an attempted coup against a sitting president of the United States. Whether it‘s [former FBI Deputy Cirector Andrew] McCabe or Comey or a lot of them, where does it go? How high up in the White House did it go?“ Trump continued, calling on reporters to investigate the origins of Mueller‘s probe, even dangling the prospect of a Pulitzer Prize to journalists in the room.